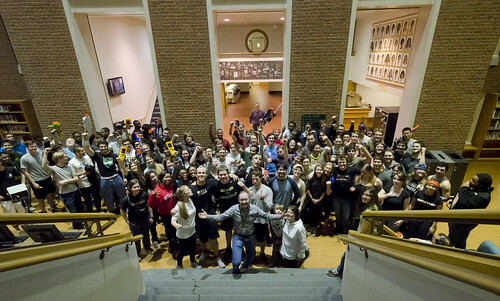 On Friday, February 7th 2014, from 7-9pm, the ZSR Library held its 9th “Humans v Zombies” event. We’ve hosted these once a semester since the Fall of 2011 and last summer we hosted two HvZ events for summer students and international students. Of the approximately 120 students who attended, a little over 30 of them were students at Chapel Hill who made a three-hour drive to attend our two-hour event. One staff member even brought her six-year-old nephew and escorted him through the zombie horde! Love working this event with the usual suspects! Susan, Tim, Mary Beth, agreed! It is always a good time and it is always great to work with the usual suspects! Love that group photo. You guys do a great job!